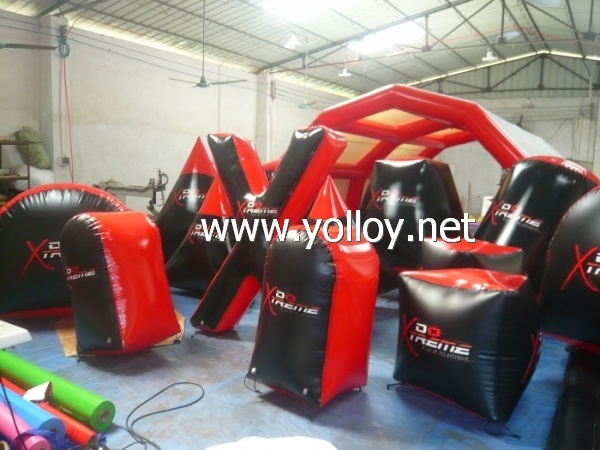 The material we used 22OZ PVC tarpaulin which mesh reinforced and both side PVC coated.It is durable,UV resistant and flame retardant.It meet NFPA701, EN71-1,2,3,REACH 151 and ROHS. There is a valve and cover on each bunker,the cover is for is protect the valve and disperse the valve’s stress. There are some elastic ring on the bunker. They are hold and keep the bunker steady when the external force hit the unit. Customized can be acceptable.If any special requirement,pls feel free to let me know.